1. Place the courgette and halloumi in a large bowl and toss in 1 tbsp oil. Heat a griddle pan and fry the courgette then halloumi in batches for 2-3 minutes until golden. 2. Meanwhile, cook the beans in boiling water for 2 minutes then drain. 3. 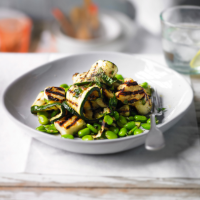 Toss the courgettes, halloumi and beans together. Whisk the remaining oil with the lemon juice and mint and toss into the salad. 4. Serve with some crusty bread if you wish.